Invalid Input. 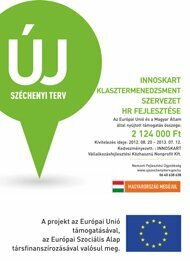 Field reqiues "http://"
Name of the lead partner: INNOSKART Business Development Nonprofit Ltd. Address: Hungary - 8000 Székesfehérvár, Móricz Zs. u. 14. 4th industrial revolution is in progress V4 countries behind the leading countries like Germany and Austria The project is creating a common platform for the partners to be prepared for the new challenges by learning from eachother. The closing international conference will give the opportunity for the partners to meet international experts outside V4 regions. Networking via the partners' contacts will support the I4 processes within the V4 regions. v4&i4 workshop - Industry 4.0 – whatever it means!